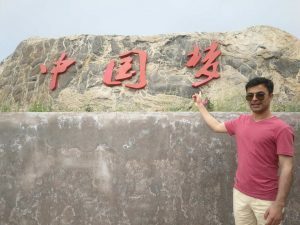 On May 12, 2018, I went to Shanxi Province of China to explore the old historic city of Ping Yao. It was my university trip. 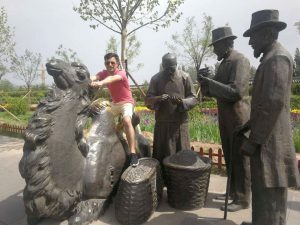 Every semester, the international student office take our trip to different historic cities of China. The journey started from Beijing. We took the fast train to reach Ping Yao. As soon as I get out of the railway station, the first glimpse was the most attracted features of the City wall, the whole city was surrounded by the wall. The city is also known as ‘Turtle City’ because of its turtle-like city wall. There are six gates along the wall. Four of them are symmetrically set on the east and west sides, looking like the four legs of the turtle. The Southern Gate and Northern Gate resemble the head and tail of the turtle respectively. Looking down from the top, it is exactly like a giant turtle with the crisscrossing lanes forming the patterns on its shell. 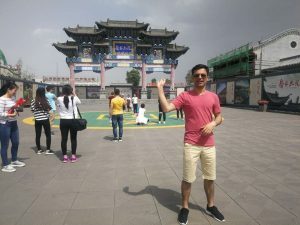 I found the City a living museum, with its intact city wall, its residences and shops, and even its government offices all were preserved in the style of China’s Ming and Qing Dynasties (from the 14th to 20th century). Furthermore, it retains all the Han city features, provides a complete picture of the cultural, social and economic development in Chinese history. It is until now of great value for studying the social form, economic structure, military defense, traditional thinking, cultural values and dwelling form. 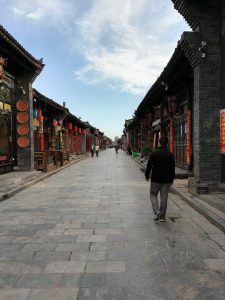 Walking its alleys and thorough fares, it’s easy to imagine what life was like in old times long gone, when Ping Yao was the financial center of China. The most important place of this city is Rishengchang Exchange Shop, located in the center of the city. Furthermore, it is the first ‘bank’ in China’s history which is also known as the ‘Father of Chinese Banking’. It once controlled the lifeblood of the nation’s economy in the Qing Dynasty (1644 – 1911), with more than 30 branches throughout the country. This bank allowed bills, instead of gold and silver, which to be used for business transactions. What it means is that merchants at that time going to other parts of the country to do business did not have to transport large quantities of gold or silver with them, instead they used the bills, which made it more convenient for the merchants, also contributing into the prosperity of the city. The only way to explore the city is on foot, since there are no cars within the walls of the city. The main drag is Ming-Qing Street, where the shops sell gewgaws and artwork. The night view of the street is mesmerizing, the traditional lamps are lighted, the red Chinese lanterns hanged in front of every shop and house, beside this the multicolored lights are displayed on the streets. Most romantic are the dusty backstreets, where chickens peck and people navigate the rough roads on bicycles. But the city, with its low, swooping, grey-tiled roofs, is best seen from above. For that, I walked on the top of the city walls, resting in the watchtowers along the way, looking the awe-inspiring architectural designs carried my thoughts into the past, when I realized the present into the past, those feelings cannot be expressed, it was magical. 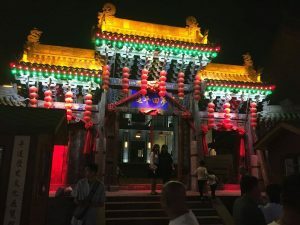 In addition, this city was named a world heritage by UNESCO in 1997, as “an exceptionally well-preserved example of traditional Han Chinese city.” To Explore the city more, I went to the east part where the temple of City God is located. This is a sacred place, also known as the God of Wealth and Kitchen God because this city was the economic hub of the country and many wealthy merchants used to live here. The temple has many exquisite pavilions and towers. The colored glaze decorations shining under the sun light make it magnificent. Beside the above places there are many more tourist spots, like, Ping Yao Confucian Temple, Ping Yao Ancient Government Office, Shuanglin Temple, Gushi Tower, Ping Yao County Government Museum, Zhenguo Temple as well as the Qiao’s Family Compound which is on more than one hour drive from the Ping Yao Ancient City. Walking by the streets I noticed many Hotels. All of them were well decorated a remake of Ming and Qing Dynasty style. 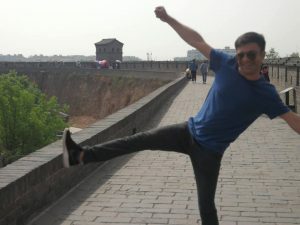 I decided to book a room since I was on two days trip, so I went to the Journey Ping Yao Hotel. It was in a quiet little alley a few minutes’ walk from the south gate of the city. It is well renovated courtyard house built in the reign of Emperor Qianlong. This was a wonderful experience for me, I felt like I was breathing in the same old era. Something unique about this place is that everything is old and preserved which gives the impression of back in the ancient times; it was my first time to experience such kind of hotel. Local staple food in Pingyao is mainly wheaten products like noodles and clay oven rolls, just like the ones you find in many other parts of China. But beside Noodles, the most delicious ones are Pingyao Beef (Píngyáo niúròu) and Wantuo (Píngyáo wǎntuō). If you ever come to China, do visit Ping Yao. It is worthy of your time and money.